2017, ISSN (Online) 1869-2737, ISSN (Print) 1869-2729, Routledge, London, 155 p.
It is my pleasure to greet you as the new Managing Editor of Contemporary Japan! As our Editor-in-Chief Franz Waldenberger announced in our first issue of the year, beginning with CJ 29(1) I have taken over from the capable hands of Peter Backhaus. Building on my research background in Japanese Studies and training in cultural anthropology, I hope to further expand and deepen CJ’s interdisciplinary tradition and international reach. Also, beginning with the spring 2018 issue of CJ 30(1), CJ has transitioned to an open call-for-papers with rolling submission. We welcome submissions from scholars around the world working in any discipline on aspects of contemporary Japanese society. We also continue to accept proposals for Special Issues. Please feel free to contact me with any questions about publishing with Contemporary Japan. This introduction to the special issue on the Japanese diaspora sets the background to the theme by summarizing the key components of diaspora theory and pointing out some fallacies and conceptual shortcomings this volume attempts to overcome. 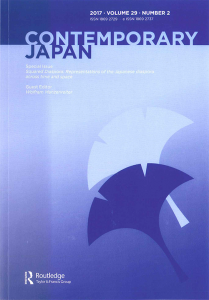 The article argues that the complexity of the contemporary diaspora of Japanese emigrants and their descendants at the intersection with the emerging Nikkei diaspora provides peculiar insights into the spatial dimensions and social dynamics of transmigration. Rather than taken for granted the conceptual differentiation of diaspora and homeland, it argues to understand them in terms of dynamic relationships between space, time and identity, which are realized in discourses and forms of practice. Contributions to this volume square the conceptualization of the diaspora and the homeland. They provide evidence for the argument of the ‘squared diaspora’ by pointing out the shifting alignments of locality, identity and agency. Identity and representations of diasporic belonging therefore are varying and fluid concepts, depending on generation, ascription, and collectively shared assumptions about the utilitarian value of ethnic labeling. The volume also warn of the analytic shortcoming of privileging one subjectivity like place of birth or ethnicity over all others. In this paper, I use the lens of food to analyze immigrant integration, focusing on Nikkei cuisine, a type of Japanese ‘fusion’ food that emerged in the context of Japanese immigrants’ integration in Peru. Through the process of culinary transformation and food discourse in Peru, my aim is to analyze how a new genre of cuisine emerges and what it tells us about immigrant integration. I illustrate this by focusing on Nikkei Peruvians, or later-generation descendants of Japanese immigrants in Peru, whose identities have long been regarded as ambiguous despite their enhanced status and representation in the country’s political and economic arenas in recent years. The emergence and growing popularization of Nikkei cuisine, I argue, symbolizes the integration of Nikkei Peruvians into Peruvian society. Yet, the representation and recognition of Nikkei food as ‘Peruvian and Japanese fusion food’ indicates how Nikkei Peruvians integrate in Peru as Nikkei Peruvians. This was facilitated in the context where Peru increasingly celebrates its cultural diversity, promoting fusion food at the core of its identity in trying to brand itself as a diverse nation and boost its economy. Rooted-transnationalism and the representational function of food in Hiromi Goto's "Chorus of Mushrooms"
This paper uses a close reading combined with Koichi Iwabuchi’s nascent concept rooted-transnationalism to illustrate the representational function of food in Hiromi Goto’s Chorus of Mushrooms. By examining the representational function of food, we can understand how Goto chooses to arbitrate the belonging of the Canadian Nikkei characters in her novel. The three generations in the matrilineal Tonkatsu family begin the novel with varying (almost stereotyped) cultural identities, but by understanding how their identity is represented through food as the novel progresses we can see these identities worked into a nuanced dialogue with the modern diaspora condition. We learn that explanations of diaspora identity in literature using transnationalism as a framework can be enhanced by considering cultural identity in terms of its rootedness, particularly how it interacts with sociocultural factors at varying spatial levels. Understanding the representational function of food in a rooted-transnational context shows how food problematises the belonging of Nikkei yet can also provide emancipation from the challenge of diasporic cultural identity. Through this analysis of Goto’s novel, we can gain a deeper appreciation of the complexity of modern Nikkei diaspora cultural identities. In the life of a Japanese Canadian Christian church, food – especially Japanese cuisine – occupies a central place in parish life. Food not only nurtures members of the congregation physically but it serves as a focal point for collective identity formation. In the community where the majority of members are still survivors of Japanese Canadian internment during World War II, I argue that by planning, preparing, and serving food, women constantly create and maintain the imagined homeland in a Canadian diaspora. Based on 2 years of ethnographic fieldwork, this paper illustrates the ways in which food serves as a symbolic means to create a homeland and define women’s position within that cultural creation. The paper also illustrates the ways in which ‘race’ is experienced in dynamic ways in relation to the group’s shifting position in the global arena by contrasting the bitter experience of Japanese Canadians during World War II with the recent popularity of Japanese food. In comparison to common department stores all over the world, the Japanese department store Shirokiya in Honolulu, Hawai’i, seems to be more than just a department store. For sure, goods are displayed and sold effectively, accompanied by thoughtful marketing strategies. But aside from this, elderly people stroll around with their arms crossed behind their backs, obviously not intending to buy anything at all. At a closer look, it appears that Shirokiya as a specific place in Honolulu plays an essential role for the elderly Japanese Americans of the city through honouring the heritage of their ancestors. With this in mind, Shirokiya shows that analysing places like this department store leads to unique findings for diaspora research including spatial theory approaches. Therefore, in this paper, I will show how applying spatial theory, with a focus on place(s) instead of space as merely a geographical unit, extends the scope of findings in diaspora research. Drawing from the terminology of Marc Augé, I show how his concepts of places and non-places can help shed light on the important meaning of the department store for these Japanese Americans. This paper examines the role of dance in identity construction among young descendants of Okinawan migrants who settled in Colonia Okinawa in Santa Cruz, Bolivia in the 1950s and 1960s. Ryūkyūkoku Matsuridaiko, a modernized form of eisā dance that is traditionally performed at the Buddhist soul festival Obon, offers a new way for these young descendants to reconnect to their ancestors’ culture. For most observers and some practitioners, the colourful dance represents Japanese culture and values that in a Bolivian context are commonly related to the socio-economic success of this immigrant minority. However, my analysis of Ryūkyūkoku Matsuridaiko will demonstrate that the dance furthermore serves the need to negotiate issues of identity among the younger generation of an ethnic minority of Okinawan ancestry within the Japanese descendant minority. Drawing on participant observation and interviews from several stays in Santa Cruz between 2013 and 2016, my analysis illustrates how this dance is used to express and negotiate identity issues between Bolivia, Okinawa and Japan and how it connects to larger discourses of a multilocal Okinawan community. Currently more than 2.5 million Americans living on the South and North American continents are Nikkei or descendants of Japanese migrants. The history of their forefathers’ emigration from Japan and the meaning of ethnicity and citizenship while living in the diaspora has attracted considerable scholarly attention, which was renewed by the recent wave of sojourner migration by Latin Americans of Japanese origin into Japan. Virtually nothing is known so far about the impact of “return migration” and the “returnees’ remigration” on the diaspora in Latin America. To what degree have ideas of ethnic or political loyalty, of national and cultural identity, been shifting one way or the other due to the increased proximity to their ancestors’ place of origin? And how have hostile or discriminatory treatment by homeland and hostland societies impacted on the collective image of the Nikkei in Latin America? The Nikkei experience of living abroad bears the potential for rethinking the meaning of diaspora. As the return migration to the land of their ancestors has not fulfilled the postulated ‘negation of a diaspora’ (Clifford 1994), it has squared the sensation of being diasporic in the sense of being displaced twice and having multiple relationships with distinct nations which are neither just homeland nor hostland. Based on multi-sited fieldwork in Japan, Argentina, Bolivia, and Paraguay, I analyze the shifting functions of the pillars of migrant communities, i.e. family household, school and hometown associations. I argue that the Nikkei are entangled in a “squared diaspora” in which the juxtaposition of homeland and hostland itself becomes questionable, instable and fluctuating. Starting in the early 1990s, Brazil-derived Pentecostal denominations have flourished among Nikkei Brazilian migrant communities in Japan. While some researchers have characterized the phenomenon of Pentecostal conversion in this ethnographic context as a formation of ‘ethnic religion,’ the individuals often characterize themselves as primarily Christian. This article takes this apparent disconnect as the point of departure to investigate the relationship between ethnicity and religious identity. The concept of ethnic religion indicates an overlap between ethnic group and religious community, oftentimes prioritizing ethnic categories as the basic units of analysis. My ethnographic findings based on 14 months of fieldwork in Toyota, Japan, however, suggest that the very boundary of ‘ethnic group’ is fluid and unstable, which in turn shows that ethnicity cannot be taken as an analytical given. By tracing the varying narratives of four migrant converts, I detail the ways in which Pentecostalism in fact contributes to the proliferation of identities, both ethnic and non-ethnic. For example, migrant converts speak of Pentecostal ideas, practices, and networks as ‘Brazilian,’ ‘Japanese,’ and/or ‘just Christian,’ depending on the context. In conclusion, I argue that Pentecostal churches in this ethnographic context seem to give rise to generative selves rather than an ethnic religion. This study analyzes the motives of first and second generations of Nikkei Peruvians for circular migration between Japan and Peru. Adjusting their expectations with the economic demands of each country creates a circular movement that is associated with triple-win outcomes. However, while for the first generation, circular migration is a household economic strategy that allows migrants to fulfill their role as breadwinners and provide material well-being to their families, for the second generation circular migration offers a venue for building their professional careers and for self-realization. Migration movements therefore serve not only as a source of material or economic well-being, but also of emotional and moral well-being. The first generation shows a passive attitude by adjusting themselves to the ups and downs of the global economy and changes in the division of labor, while the second generation actively draws on language competence and professional skills to become agents of their own mobility. The difference between these two generations influences how each group perceives each country and the processes of identity building in each group. This think piece discusses the continuing influence of Japanese American and Japanese Canadian internment, which commenced 75 years ago in 1942 and also affected Nikkei from 13 Latin American countries. Contextualizing the Canadian case, the essay explores the lives of Raymond Moriyama, a Nikkei architect interned despite his Canadian birth and citizenship, and William Allister, a White Canadian Prisoner of War (POW) of Japan, and their mutual attempts to overcome bitterness through their architecture and art. The article explores the Canadian Embassy in Tokyo designed by Moriyama as a tree house, reflecting Moriyama’s belief that a tree house is a special place where the human spirit can dwell and soar. The Canadian Embassy in Japan as a tree house proclaims possibilities of addressing historic wrongs and embracing diversity. North American Nikkei attempts to prevent further injustices against others are related to the contemporary context in which some North American voices advocate a registry of Arab Americans. The essay asserts that the official Redress acknowledgements by the United States and Canada in 1988 that the internment of people of Japanese descent was wrong stand as a precedent against such targeting of specific groups.